Join Foxwoods Resort Casino and the Greater Norwich Area Chamber of Commerce for an evening of fun, drinks, and hors d'oeuvres at Business After Hours on Thursday, April 18, 2019. 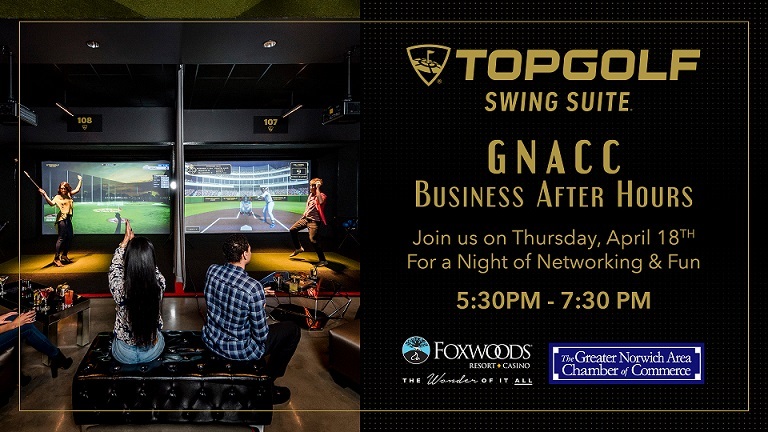 Starting at 5:30pm guests will gather at Foxwoods Resort Casino at the Topgolf Swing Suite in the Fox Tower, Mashantucket. About: Foxwoods is driving in new entertainment with Topgolf Swing Suite! When it comes to play, the possibilities are endless with interactive simulators offering a variety of golf and non-golf games. Go from smashing a 7-iron to striking out a batter with a fastball in a matter of minutes. It’s all that and more when you step up to the big screen. Plus, you can leave the simulators behind and hit up the wide range of old-school arcade games, grab a drink, something to eat, and head for the lounge. Stay close to the casino action with slot machines conveniently located at the bar. Topgolf Swing Suite is perfect for business and social gatherings, including birthday and bachelorette/bachelor parties. Business After Hours - Networking at its best!! Our Chamber believes in and is passionate about networking. We believe nothing can take the place of personal interaction when it comes to growing a business. Join us for refreshments, raffles (bring your business cards), and more! For more info, please visit our Events Calendar or call us at (860) 887-1647. If you register and are unable to make it, please notify us by NOON the day of the event. ABOUT Foxwoods Resort Casino: Foxwoods Resort Casino is one of the premier hotel, gaming, shopping and entertainment destinations in the Northeast. As the largest resort casino in North America, Foxwoods offers a vast array of gaming in seven casinos; AAA Four-Diamond hotels, restaurants from gourmet to fast casual, world-renowned spas, awarding-winning golf, state-of-the-art theaters, exclusive retailers and free-to-play online casino games at FoxwoodsONLINE.com. The Mashantucket Pequots are a native Algonquin people in Southeastern Connecticut known for their “Pequot spirit of survival”. Their unprecedented story can be relived in vivid detail at the Tribe’s world-renowned Mashantucket Pequot Museum and Research Center. The tenacity of the Mashantucket Pequots brought them through centuries of persecution to economic prominence today. Not-Yet GNACC Members $20.00 (Not-Yet-Members can attend (2) Two BAH Events per calendar year). Not a GNACC Member Yet?...Contact the GNACC Office at 860-887-1647 to talk about joining The Greater Norwich Area Chamber of Commerce and learn all of the benefits it comes to being a member!! Online Registration will close at NOON on 04/18/19. Pre-Registration is highly recommend but Walk-Ins are Welcome (but please note, we may not have a GNACC Name Tag available). If you register and are unable to make it, please notify us by Noon the day of the event.